Pakistan’s leg-spinner Yasir Shah smashed the 82-year old Test record by registering his 200th wicket in just 33 Test matches. He enjoys the privilege of being the fastest to achieve the milestone. 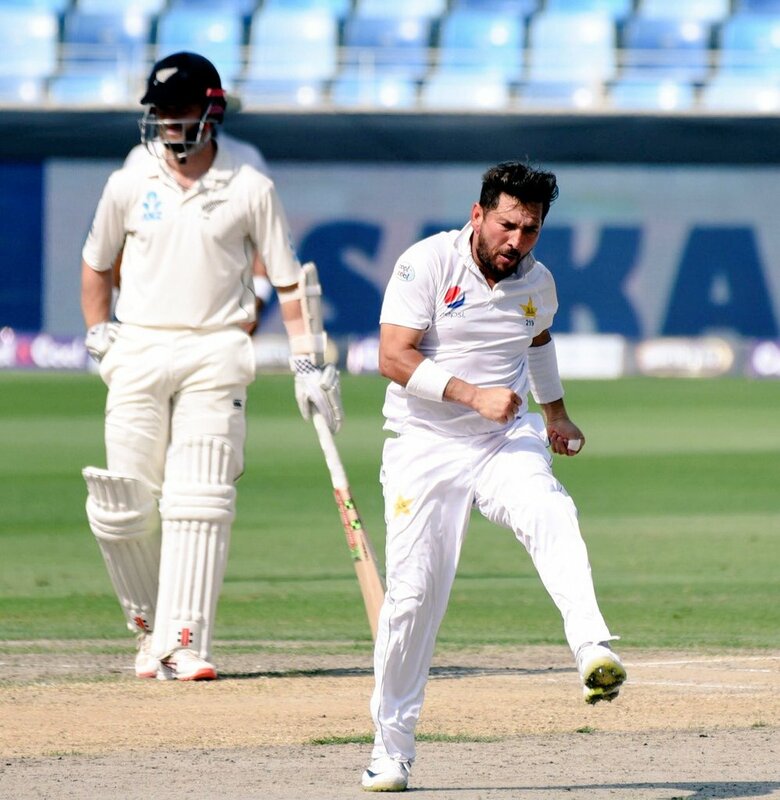 The much-awaited moment arrived in the ongoing third Test between Pakistan and New Zealand being played at Abu Dhabi, UAE. New Zealand commenced day four of the Test in a delicate position at 26/2. Will Somerville, the debutant left-arm spinner, sent as the night-watchman was one of the survivors from the third day. He was trapped in front of the stumps early by Yasir Shah and the wicket earned the bowler an important record in Test cricket. Clarie Grimmett, the Australian leg-spinner, had reached the milestone of 200 wickets in 36 Tests and was the fastest to that figure. Grimmett achieved the feat against South Africa at Johannesburg in 1936. It has taken 82 years for someone to speed past him, incidentally, it is another leg-spinner. The 32-year old is enjoying his time on the helpful tracks of UAE. Yasir Shah returned with the match figures of 14 for 184 in the series-leveling victory in the second Test. This included the incredible bowling spell of 8/41 which saw New Zealand crashing in the first inning. Yasir’s match figures remain the second-best bowling figures for Pakistan in Test cricket. Yasir Shah began the third Test with 195 wickets in 32 Tests. He snared three early scalps on the opening day of the rubber. Bilal Asif ran through rest of the lineup to keep Yasir stranded on 198. In the second dig, Yasir dismissed Tom Latham and Will Sommerville to complete his double century of wickets in just 33 Tests. The Pakistan leg-spinner was second-fastest to 100 Test wickets as Yasir Shah was just one match short of George Lohmann’s tally of 16 Tests. He is currently placed seventh in all-time wicket-takers of Pakistan. His next aim will be to go past Saqlain Mushtaque’s total of 208 Test wickets.